Have you ever been surprised when your knee crackles? Maybe you were stretching at the time or just standing up after a long time sitting. Perhaps you were climbing stairs or walking down the street. No matter the case, you may be wondering why it happens and if there is anything you can do to prevent it. You might also be asking yourself if it is something you need to worry about or it is just a part of life. Why Your Knee Crackles When Bending? 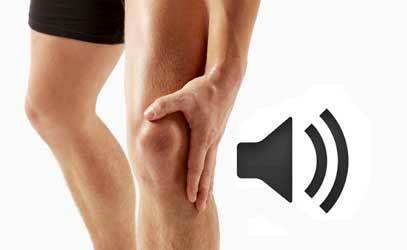 The medical term crepitus is basically the occurrence of joint noises. These noises are common and can range from mild rubbing or vibrations to loud popping sounds. Soft-tissues can produce the same grinding sounds and sensations as joints. When carbon dioxide gets trapped in your joint fluid, it creates gas bubbles that make a popping noise when the pressure in the joint changes. It sounds similar to when cracking your finger's knuckles. Medical professionals refer to this as cavitation. Most of the time, it is nothing to concern yourself over. “Cracking” your joints does not lead to permanent damage like arthritis as some would have you believe. All the joints in your body are located near tendons and ligaments. Considered soft tissue, they stretch in order to keep joints and bones in their proper positions. Occasionally, one might snap back in place when repositioning. This may result in a popping noise. Sometimes this is what causes knee crackles when bending down and getting back up. What If It Comes with Pain? The cartilage which lines your joints is called meniscus. When there is a tear in it, the meniscus can get caught on your knee and cause it to pop as it moves. The pain will probably be inconsistent, only occurring as the damaged cartilage touches the joint. Your joints and cartilage get worn down over the years, thinning so much that bones no longer have cushion between them. This is referred to as arthritis and typically occurs in people over 50. It can get worse over time, with an increasing and consistent pain. Just because you are healthy does not mean you are immune to knee joint pain. Often athletic young adults and adolescents can suffer from knee conditions. Sometimes the cartilage lining in the kneecap can become inflamed and irritated. When this happens, your thigh bone and the back of your kneecap can cause friction, which leads to persistent cracking noises and pain. If your knee crackles when bending, you may suffer from runner's knee. This condition occurs when your kneecap has a problem moving about the knee, which leads to a painful grinding feeling. The pain typically worsens with extended activities like jogging or after continued inactivity like sitting at a desk. When you tighten your calf muscle and then release to relieve the tension, you are shifting the pressure around your kneecap. This allows for it to realign and alleviate your knee joint pain. The exercise is fairly simple to conduct. Sit on the floor with your legs straight in front of you. Place your calf on a tennis ball and put your other leg on top of it. Lift your legs slightly while rolling the ball until you find the painful spot on your calf. Stop moving the ball and point your foot down and up for about 30 seconds. Repeat as necessary. Sometimes knee pain is actually a symptom of a misaligned hip. To put it back in place, try this exercise. Start by taping two tennis balls together as you need to cover a bigger space. Lying flat on your stomach, place the balls right below your hip bone. Put as much weight as you can tolerate on the balls. Turn your knee on the same side as the knee pain into a 90 degree angle. Swing your leg as far as you can side to side. Continue for at least 30 seconds or as long as 2 minutes and repeat as needed. Your leg has a ligament that runs from the outer side of your thigh down to your shin and is attached to your knee. Named the iliotibial band, it is designed to stabilize the movement of your knee joint. If it becomes inflamed, it can move your kneecap out of place. To assist in repositioning your cap, lie on the side with the pain. 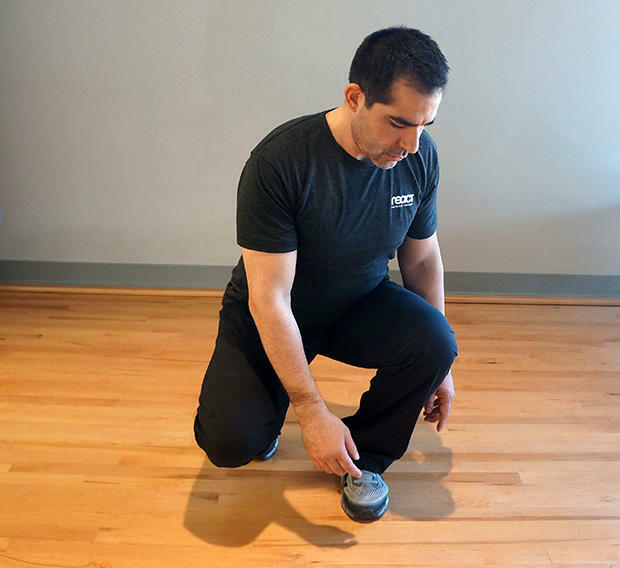 Put a roller made of foam at the halfway point between your knee and hip on the bottom leg. Slide over the roller, up and down from the lower hip to the top of your knee. Roll over the tender spots as much as tolerable. Continue for a minimum of 30 seconds, repeating as needed. Your knee crackles when bending when it is out of alignment. This can occur when there is an imbalance and your kneecap is push out of place. Since your outside quad muscle is often not as strong as the muscle on top, it helps to strengthen it. A simple exercise that might help requires a resistance band of medium taut. Place the band around your legs, positioning it immediately below your knees. If possible, lower your body to a squat. If not, remain standing. Slowly take two steps to the right, holding while you then take two steps to the left. Stretch the band as you pull your legs apart. Repeat 3 sets. Inside your kneecap is a tear-drop shaped muscle, which can grow weak and pull your kneecap out of alignment. To prevent this from happening, you have to strengthen it like your other quad muscles. Stand with your legs split in a stance, with one in front of the other. The bulk of your weight should be placed on your front leg. As you squat, keep your front knee aligned over your ankle. While in the squat, turn your front leg towards the right and hold for up to 5 seconds. Release as you return to your standing position. Each leg should do 3 sets of 15 squats. Jumping is naturally hard on your knees, as they absorb a bulk of the shock when you land. Learning to jump correctly can prevent knee crackles when bending. The best way to land is in the half squat position. When you hit the ground, think how tendons and muscles cushion your landing and protect your joints. 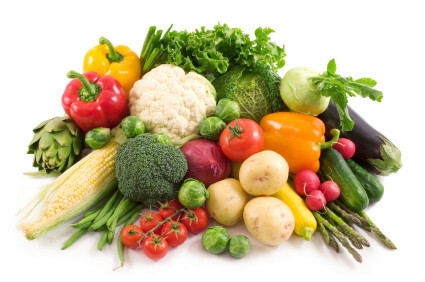 Like every other part of your body, your joints are affected by what you eat. Eating fatty fish, fish oil supplements, antioxidants, fresh fruits and vegetables, vitamins and minerals will help fight inflammation and other toxins which can lead to joint deterioration.